Fleas are not picky when it comes to finding a warm-blooded host. This means even the smallest members of your family are susceptible to fleas. In this article, I will explain how you can identify and treat flea bites on babies. I will detail why fleas can bite your baby and potential signs of a flea infestation. Most importantly, you will learn what precautions you can take to prevent fleas from biting your baby again. Why Are Fleas Biting My Baby? When it comes to fleas, knowledge about how they operate is crucial. The faster you can identify the signs of a flea infestation, the quicker you can get rid of it. This includes getting familiar with the symptoms of flea bites. 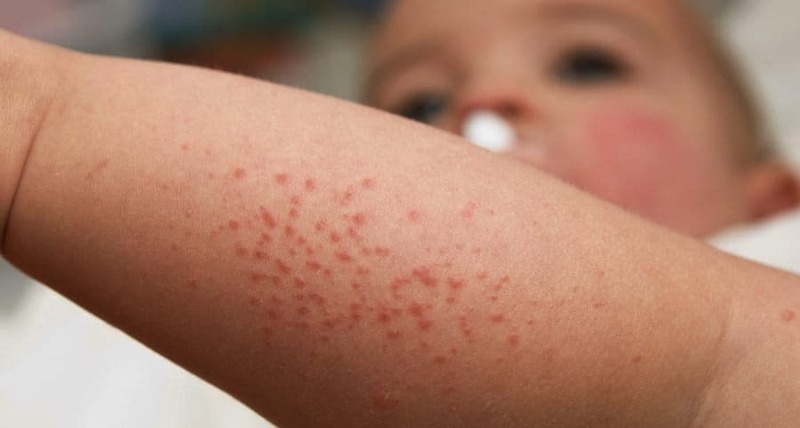 If you have a baby in your household, you need to learn how to recognize flea bites. Your baby cannot communicate the reason for his or her discomfort. It is essential to act quickly to save your baby unnecessary pain and irritation. Flea bites appear as tiny red bumps. They are distinctive from other insect bites because they usually appear in clusters of three. Flea bites are unbearably itchy and can be painful, too. The flea bites may also grow swollen or blister. The appearance of the bites can differ slightly - depending on the number of bites and personal sensitivities. Physical symptoms of flea bites do not always appear immediately. You can expect to see a physical manifestation of the bite within 30 minutes or so of being bitten. Why Are Flea Bites Irritating? Flea bites irritate because of the components in a flea’s saliva. When fleas bite a host, they also inject their saliva into the bite. The flea saliva contains a special substance that acts as an anticoagulant. It prevents the host’s blood from clotting, making it easier for the flea to feed. Fleas can bite babies in one of two circumstances. Either your baby was exposed to fleas in a location outdoors, or there are fleas inside your home. Review your baby’s location and activities after you spot the flea bites, to eliminate potential causes. If your child returned from a relative’s home with flea bites, investigate further. Perhaps your relative owns a pet with a case of fleas. Alternatively, your baby may have been taken outdoors without appropriate protection from insects. Any building that lacks proper maintenance can become infested with fleas. This includes childcare facilities. One children’s daycare facility in Mississippi dealt with a massive flea outbreak. Flea-infested stray cats had settled into crawl spaces underneath the facility. The fleas were then able to enter through the floor and attack the facility’s young patrons. If your baby has not been taken off your property and displays flea bites, you are likely to have a flea infestation. If you suspect this is the case, a thorough examination of your household is necessary. Untreated pets are usually the main culprits when it comes to fleas inside your home. You can conduct a quick physical examination of your cat or dog to check for fleas. If your pet has fleas, your baby could be exposed through direct contact with the animal. Fleas throughout your home could also be responsible. The adult fleas you spot on your pet are just a small percentage of the actual infestation. These parasites only live on their hosts as adults. The females lay eggs on your pet, which then drop off into the surrounding environment. This means wherever your pet has been, there could be flea eggs, larvae, and pupae. Once adult fleas emerge from the pupae, they will instantly begin seeking a host. If your pet is not available, the fleas will target any host in the vicinity – including your baby. Older children also often get bitten by fleas, as they're more likely to interact with pets in various parts of the house. You can have fleas without pets. As with the daycare facility mentioned earlier, stray or wild animals could be living in or around your home without your knowledge. Contact a pest control expert if you suspect this might be the case. It is always advisable to consult a doctor over flea bites in people of any age. This is because fleas can carry diseases and parasites that could be transmitted to the host. Your doctor may prescribe other medications to treat potential complications. For example, some fleas can transmit a parasitic tapeworm when they bite. A course of medication for tapeworm infection might be given to your baby as a precaution. That said, there are some things you can do at home for your child’s bites. Gently wash the bites with water and soap. If you are using an antiseptic soap, make sure that is suitable for use on babies. If the bites are very swollen, you can apply a cool washcloth to the affected area. This can also help soothe the itching. You will want to discourage your baby from scratching at or touching the bites. Picking or scratching flea bites can increase the risk of a secondary infection. Depending on your baby’s age, you might want to trim their nails short as an extra precaution. You can also dress your baby in clothing that prevents access to the bites. You can purchase over-the-counter medications to help alleviate itching. There are many topical lotions as well as tablets that can reduce the irritation of the bites. However, not all of these products are appropriate to use on children of all ages. If your baby has any pre-existing medical conditions or allergies, certain medications might not be safe. To relieve pain from the bites, you can purchase children’s anti-inflammatories from your pharmacy. These medications are specially formulated to be safe for young children and babies. Select one that is suitable for your baby’s age. Keep in mind that infants and very young children are the most at risk when it comes to adverse reactions to misused medications. If you choose an over-the-counter treatment, read guidelines and follow them explicitly. Hypersensitivity to flea bites can result in a more extreme reaction. A disorder known as papular urticaria can occur if you are sensitive to flea bites (more specifically, flea saliva). Papular urticaria is more common in children than adults. This is because children, particularly infants, tend to be less desensitized to flea bites than adults. Also known as persistent, insect-bite reaction, papular urticaria is a chronic disorder. In the “active” phase, clusters of red, itchy bumps can appear on the body. Although the condition is not inherently dangerous, it can be very uncomfortable. Occasionally, the recurrent rash can leave permanent marks. If your baby is presenting these symptoms after being bitten, consult a doctor for the best treatment options. If your baby was bitten by fleas at a facility or someone else’s home, the solution is simple. Do not take your baby to the location until all fleas are exterminated. If you are going outdoors with your baby, take precautions. Heavily-wooded areas can be hotspots for fleas. Keep their arms and legs covered to avoid being bitten. If the cause of the bites turned out to be fleas on your property or pet, you need to keep your baby away from your pet as much as possible, until you have eliminated the infestation. Getting rid of fleas involves a comprehensive effort on your part. This means that you need to treat your pet, home and yard simultaneously. Begin by taking your companion animal to the vet for a flea treatment. Not all flea medications and repellents are safe for all pets. Your vet will recommend a treatment option fitting for the age, size, and species of your pet. Any health conditions your pet may have will also be taken into account when prescribing a treatment. Insecticide will be your last tool of battle, both indoors and outdoors. Start by vacuuming all surfaces in your home to capture any flea eggs, pupae, or larvae. Pay special attention to your pet’s favorite areas to rest and play. These likely have the highest populations of fleas. On the same note, you will have to wash your pet’s bedding. It's also possible that fleas are hanging around yours or your babies bed - especially if you infested pets frequently visit the bedrooms and lay on the bedding often. Outdoors, clear up your yard: cut long grass, remove piles of debris and trim heavy vegetation. A messy yard can be an optimal breeding ground for fleas. Examine your property for vulnerabilities, such as crawl spaces. You don’t want flea-infested wild animals to target your home as a potential nesting ground. Finally, select an insecticide for your home and yard. There are multiple options on the market containing different active ingredients. You will want to select a pesticide that is child-safe (and pet-safe, if you have one). Always follow instructions carefully for use and disposal of any insecticide. If your flea infestation is severe, consider calling a professional exterminator. The goal is to get your family’s environment flea-free as soon as possible. To prevent fleas in the future, maintain regular treatment of your pet and your yard. Depending on the climate in your area, you may only have to do this once per year - before the summer months. Flea bites on babies can be unpleasant for both the baby and the parents. It is critical to identify how your baby was bitten, in order to swiftly address any potential flea infestations. Needless to say, you don’t want your baby getting attacked by fleas to be a recurring issue. Prevention is the best strategy for fighting fleas. Keep up with yard maintenance and keep your pet up-to-date on flea treatments.